This fall, horror fans will be able to experience the iconic classic Phantasm on the big screen once again, with a brand new 4K restoration that was overseen by filmmaker J.J. Abrams. Today it was revealed that a brand new poster was created for this Phantasam Remastered event, designed by artist Aaron Lea. You can even order this poster for your very own collection, before re-visiting this classic on the big screen. Starting today, these posters will be available for purchase at Phantasm.com's Phactory Store website. The new posters will cost $20, but you can also buy posters autographed by director Don Coscarelli for $35. Here's the description of these posters from the Phactory Store website. "Brand New!! 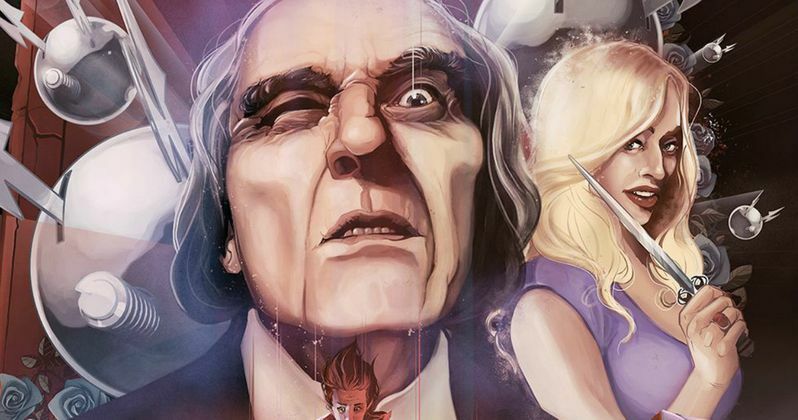 This gorgeous limited edition poster by artist Aaron Lea was commissioned for the 2016 theatrical release of the stunning Phantasm Remastered. Mr. Lea paid homage to all the elements of the original 1979 Avco-Embassy poster, including Spheres, Hooded Dwarf Creatures, the luscious Lady in Lavender and the iconic Tall Man. Suitable for framing. Limited Quantity!" Phantasm centers on the residents of a small town, who have begun dying under strange circumstances, leading young Mike (Michael Baldwin) to investigate. After discovering that the Tall Man (Angus Scrimm), the town's mortician, is killing and reanimating the dead as misshapen zombies, Mike seeks help from his older brother, Jody (Bill Thornbury), and local ice cream man Reggie (Reggie Bannister). Working together, they try to lure out and kill the Tall Man, all the while avoiding his minions and a deadly silver sphere. Last month, Well Go USA announced that they have obtained the rights to the entire Phantasm franchise, including Phantasm Remastered, and the new film Phantasm: Ravager, which will be the final installment in this beloved series, directed by Don Coscarelli. Phantasm Remastered will hit theaters across the country as part of Art House Theater Day on September 24, 2016, and Phantasm: Ravager will be released in select theaters on October 7th. Well Go USA will also release every Phantasm movie in HD through cable and digital platforms, before collector's sets and individual Blu-rays and DVDs of all the films are released later this year. Take a look at the Phantasm Remastered poster below.